Sonography Tech is a field that’s become very popular and in demand in recent years. If this career appeals to you but you have questions, you’ve come to the right place, particularly if you’re looking for sonography tech schools in Oregon. Read on to learn how you can become part of this demanding and challenging career. Aspiring diagnostic medical sonographers may have difficulty sonographers in Oregon because there is only one school in Oregon to offer this type of training, according to Education News. 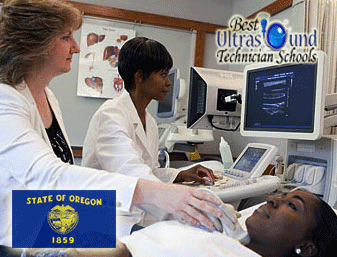 This school, the Oregon Institute of Technology, offers a diagnostic medical sonography program. Although this program is not CAAHEP-accredited, it is accredited by the Northwest Commission on Colleges and Universities (NWCCU), so graduates are eligible to sit for the certification exams administered through the American Registry of Diagnostic Medical Sonographers (ARDMS). Oregon Tech reports that graduates of its program have excellent pass rate on the ARDMS exam. In addition to Oregon Tech, students also have a few other options. Three schools, the University of Wisconsin-Milwaukee; Jackson College in Jackson, Michigan; and Washington University in Topeka, Kansas offer ultrasound technician programs through distance learning. A third option for Oregon residents is enrolling in an ultrasound technician program in a neighboring state such as California, Washington, Nevada or Idaho. Some of the above-mentioned programs are for those just beginning this career and others are aimed at those who are already working and/or certified in sonography or another healthcare field. Does the Ultrasound Tech School in Oregon Offer a Degree Program? Oregon Tech, one of the only ultrasound tech schools in Oregon, offers a 4-year program that culminates in a Bachelor of Science in Diagnostic Medical Sonography. The program has a curriculum that includes general education courses, healthcare and major-related courses, and clinical education. The first year includes general education courses such as anatomy and physiology, algebra, chemistry and English composition. The second and third year include lab studies with courses such as pelvic sonography; cross-sectional anatomy; sonographic principles and instrumentation; fetal echo, neonatal and pediatric sonography; pathology; and healthcare management. Students spend the final year completing externships in area healthcare facilities to obtain real experience performing diagnostic medical sonography procedures. Students who choose online diagnostic medical sonography program can complete general their courses through distance learning. Alternatively, they may choose to complete general education courses at their local college in Oregon and complete the health-related courses online. Once the courses are successfully completed, the students can complete their externships at local hospitals or healthcare facilities. What is Career Outlook for Graduates of Ultrasound Technician Schools in Oregon? As of May 2012, the state of Oregon had 460 diagnostic medical sonographers employed, and they earned a mean annual wage of $81,010, according to the U.S. Bureau of Labor Statistics (BLS). This amount is substantially higher than the nationwide average wage of $66,360. In fact, Oregon ranks as one of the highest paying states for this occupation. The BLS also reported that these medical professionals would see an employment growth of 46% between 2010 and 2020. Obtaining certification and improve employment options; certifications in multiple areas of sonography can enhance the resume even more.